West Virginia—it’s the final frontier. Being that I was only in Huntington for the day, I made sure to scope out someplace unique and truly “West Virginia” for lunch. So, the folks at Hillbilly Hot Dogs in Huntington, West Virginia certainly had their work cut out for them. And I’m pleased to tell you, they did not disappoint. Not being the most familiar with West Virginia delicacies, going to any restaurant with the word “Hillbilly” seemed a safe bet. 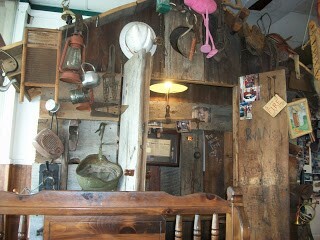 And by the decor of “Hillbilly Hot Dogs,” I could tell this was the place to be. 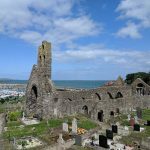 So, just what is this place known for and what makes it so special? Well, obviously, it’s a hot dog stand. But what they are most known for is their hot dog challenge. 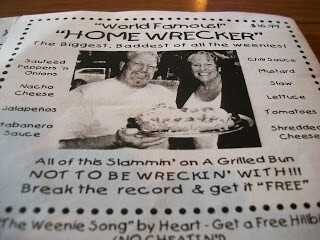 Called the “Home Wrecker,” a participant must eat a 15-inch hot dog in less than 12 minutes to win a free T-shirt. I was tempted, but felt that such an activity would likely hinder some of the other activities I was hoping to enjoy later that evening with my wife. I mean, it’s named the “Home Wrecker”—and likely for a very good reason! So I opted to go with a staple menu item instead on the recommendation of my friendly waitress. I ordered the “Hillbilly Hot Dog”—a deep-fried hot dog with homemade chili sauce, mustard, and onions. For a side, I again took my waitress’ advice and ordered their garlic ranch fries with bacon. The bacon was “optional”, but let’s be honest, is bacon ever truly optional? While I waited for my food to arrive, I took a look around the place. 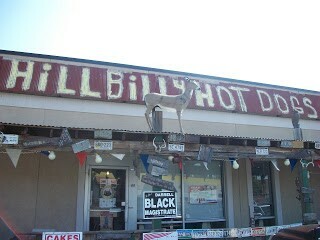 It was certainly unique and absolutely what I’d expect from a place called “Hillbilly Hot Dog”. The owner, Sonny, came over to my table to greet me personally and shared his story. He told me this is not the original location and that the original is even more unique than this place. By unique, he meant vans and other vehicles sit lodged into the tops of trees, and other such fascinating pieces of artwork. He encouraged me to check it out, but unfortunately, I did not have the time. Definitely next time. When my order was ready, Sonny brought it to my table and graciously thanked me for my business. As soon as I saw my food, I was afraid I had made a mistake. Surely, one hot dog would not be enough to satisfy my hunger and curiosity. 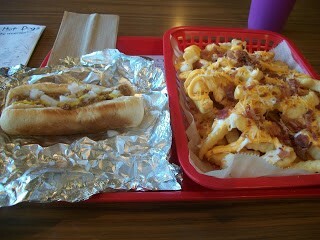 Well, even though I only ordered one hot dog, I can tell you that it was one of the best chili dogs I’ve ever had. This was the first time I have ever tried a deep-fried hot dog and it was delicious—so juicy and full of flavor. It just goes to show that you can deep fry just about anything and it will instantly taste even better. And their chili sauce was excellent as well. As for the garlic ranch fries with bacon, they were probably the best french fries I’ve ever had. Seriously, adding garlic, ranch, and bacon to a pile of french fries is just brilliant. Oh, and of course the melted cheddar cheese—you can’t forget the cheese! In conclusion, my entire experience at Hillbilly Hot Dogs was excellent. Now if only I can find an excuse to return to Huntington sooner and try the rest of those hot dogs.